Our partner school in Montpellier, LSF Juniors, organizes programmes for young people between 11-16 years of age. The school is located in a private French school, 5 minutes by foot from Montpellier's historical centre. Students have everything they need to learn French in the best conditions and to make the most of their language stay in the south of France, with excellent facilities. Apart from a language course with accommodation, the programme also includes a full activity programme through which students really get to know Montpellier and its surroundings. Prior assessment of the student’s level through a level test on the first day at school. Absolute beginners may not need to complete this test. Activities and excursions are only include when booking both course and accommodation. Otherwise they can be booked against a surcharge. The school’s social activity programme provides an exciting mix of sports, museum visits, sightseeing trips, treasure hunts, barbecues, discos and excursions. You will also have the chance to see the wonderful sandy Mediterranean beaches. During all activities, the group leaders accompany the students and this way 24/7 supervision is guaranteed. Airport transfer: Only included for students booking accommodation in a host family, except when arriving at the bus station; for students staying a a residence, please see the rates on our online price list. The French course consists of 20 lessons per week, each lesson of 45 minutes. The teaching approach is communicative and focuses on the student and his/her environment. Classes aim to improve the student’s speaking and listening skills, through role-plays, discussions, video and songs, activities, etc. You will be in a class with maximum 15 students of different nationalities but with the same level indication. It is also possible to book extra private lessons on request. If you book the course only, price do not include lunch and activities. Sucharge for activity programme and lunch (when booking course only): € 180 p.p. per week on the price of the course only. Please indicate on the booking form if you like to add this supplement. The youth courses with accommodation include single or shared rooms with full board, evening activity and excursion programme. The minimum age to stay in the residence is 14. Students staying in the residence are asked to leave a cash deposit of € 50 on arrival at the residence reception; this will be returned to you on departure, except if you have lost your key, left your room unreasonably dirty or caused damage to your room. The price mentioned above is for an airport return transfer on arrival and departure at Montpellier Airport. Montpellier train station: € 40 one way; € 80 return p.p. 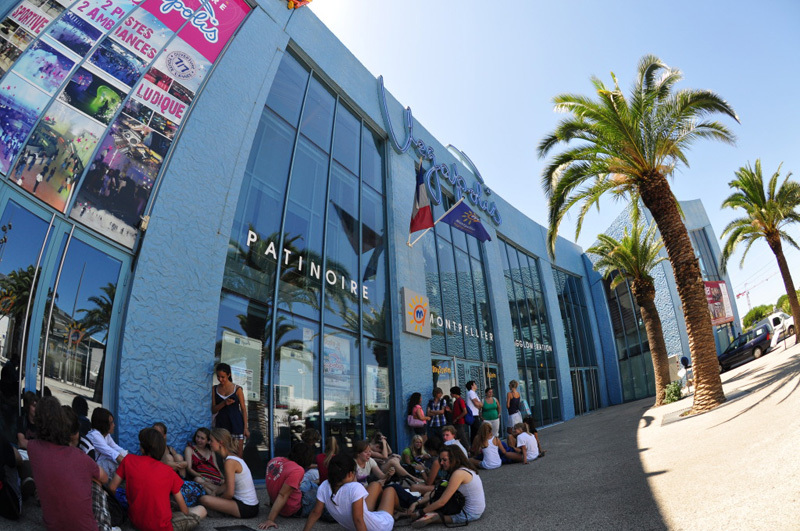 Montpellier bus station**: € 80 one way; € 150 return p.p. Nimes airport: € 140 one way; € 260 return p.p. Marseille airport: € 240 one way; € 480 return p.p. *These transfer prices are only valid for arrivals between 07.00h-22.00h. Outside these times a 30% supplement will be charged. **Transfers are not available from the bus station to the Residence “Clemenceau”. Please indicate on the booking form which transfer you want to book. Students attending the junior course can book an unaccompanied minor service for an additional € 30 each way. For students staying in a host family, the transfer on arrival and departure is only included if you arrive at the airport or train station Montpellier. The youth courses with accommodation include shared rooms full board and evening activity and excursion programme. Stays are from Sunday evening to Saturday morning. The youth courses are available for students 11-16 years (level A1 - B2). There will be no lessons on the national holiday August 15th, but a normal activity programme will take place on that day. There are no activities on June 23rd (first day of the programme) nor on August 17th (last day of the programme). Staying in a French family is the best way to practice the language. The school works with carefully selected families, who in many cases have been collaborating with the school for several years, meaning they have experience in hosting foreign students. You will stay in shared rooms based on full board (breakfast and dinner with the family, lunch in the school cafeteria). On excursion days, a lunch package will be provided. Bed linen and bath towels are provided, but students must bring their own beach towels. Families are always located at approximately 20-35 minutes distance by public transport from the school. Students will be supervised by monitors and by their host family 24 hours / 7 days a week. There is a curfew: students must be home before 23:00, unless there is a scheduled evening activity. Students aged 14 or above can choose to stay in the residence, which is located at a 20-minute tram-ride from the school for juniors. You will have a single room equipped with a study desk, closet, en-suite shower and kitchenette. The residence facilities also include a common room with vending machines for drinks and snacks, a study room, a patio and laundry services available for a small cost. Bed linen and towels are included. The staff will be constantly in the residence, meaning there is excellent supervision during 24 hours a day. The meal plan is based on full board. Breakfast, lunch and dinner are provided either at the school or in local cafés and restaurants. Packed lunches are provided at the weekends.